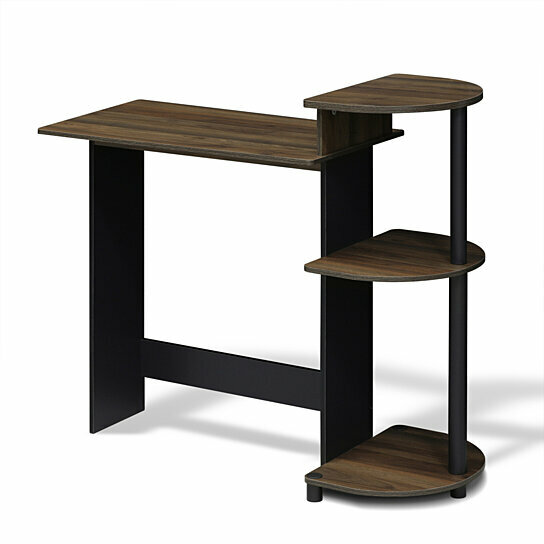 Furinno 11181 Compact Computer Desk is designed for space saving and modern stylish look. The medium density composite wood is manufactured in Malaysia and comply with the green rules of production. There is no foul smell, durable and the material is the most stable amongst the medium density composite woods. The PVC tube is made from recycled plastic and is tested for its durability. A simple attitude towards lifestyle is reflected directly on the design of Furinno Furniture, creating a trend of simply nature. All the products are produced and assembled 100-percent in Malaysia with 95% - 100% recycled materials. Care instructions: wipe clean with clean damped cloth. Avoid using harsh chemicals. Pictures are for illustration purpose. All decor items are not included in this offer. QUALITY MATERIAL: Manufactured from high quality durable composite wood and plastic tubes. PRODUCT DIMENSION: 39(W)x33.6(H)x15.5(D) inches. DESK TOP DIMENSION: 28.5(W)x28.2(H)x15.5(D) inches.